The egg hunt has begun! A great big patterned one! This is a board book about an Easter egg hunt with a cute surprise on the last page. 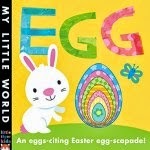 The book is written in rhyme, and there are cut-out egg shapes in most of the pages for little fingers to explore. These get progressively smaller as you go through the book. The pictures are bright and cheerful and there are plenty of animals and other things to talk about with a young child to help with language development. A simple, fun book for babies.